Winter can be tough on dogs. After all, when the weather gets too cold, or wet, or snowy for your pup, it’s time to get creative and think of fun, new ways to give him the exercise he needs inside. Of course, even in cold weather, you must still take your pup or dog outside regularly to relieve himself, but when you can’t spend a lot of time outside, you can find new ways to play with your pup. But how do you give your puppy or dog the exercise they need when long walks outdoors are not an option? Here are some tips. Find a ball that is too large for your dog to pick up with his mouth. Soccer balls and basketballs work well for large dogs. A baseball or tennis ball may work for small pups. Gently kick the ball between your feet, and then pass it off to your dog. See if your dog will try pushing it along with his nose or paws. Keep showing them how to move the ball, using your feet, and then pass it off to the pup. Most dogs will quickly catch on that they should move the ball back to you; they will use their nose to nudge it along. Dog breeds bred to find and return prey, hunting breeds, and herding breeds should pick up this game quickly. But even if your pup doesn’t catch on right away, keep trying. They’ll get the hang of it eventually. Check out this video showing one way to teach your dog the basics of dog soccer. If you’ve ever tried to do any type of floor exercises near your puppy, you know they’re very interested in absolutely everything you do on the floor. Instead of pushing them away, make them a part of your exercise routine. It’s easy to run up and down steps with your dog right behind you. If he loses interest, motivate him with a toy or a small bit of a dog biscuit. When you’re on the floor, it’s also easy to do your floor exercises and stretches while you play tug or hide and seek using a plush toy or a favorite ball. When you train your dog to do simple commands indoors, you exercise their mind and their body. “Come,” “stay,” “down,” “sit,” and “leave it” are all important commands if you want a well-behaved pup. Once these basic commands are mastered, you can move on to more play-oriented commands such as “fetch,” “shake,” “play dead,” and “roll over.” Even if your dog takes a little longer to learn your commands, stick with it. The time and mental energy involved in training is a great way to keep an energetic dog engaged on a wintery day. Teaching these commands will also come in handy when your pup is ready for outdoor play. On chilly days when you and the dog are getting bored, why not take a field trip? Not only do pups love car trips, but many pet stores, especially pet super stores, also encourage you to bring your leashed dog inside. Remember that these store trips do not replace daily walks outdoors, but they can be a way to give your dog a bit more excitement on bad-weather days, when walks are short. Some areas also offer indoor dog parks, or boarding facilities with an indoor dog play area. You and your dog may also enjoy indoor agility classes. In these classes, a coach or instructor will help you teach your dog to navigate a series of physical challenges Most challenges are about dogs overcoming new tasks (walking through a tube, jumping through a ring) and less about true physical challenge. But agility classes are a great way to help a dog expend extra energy. Dogs may be nervous on first visits to anywhere new, so allow time for him adjust to the location, and keep the first few visits short. As your pup becomes used to the new environment over time, they will learn to enjoy the outing. Want to keep your dog busy? Wish you didn’t have to pick up his toys? Why not take time now to teach him to do his own chores? Teach your pup to pick up his own toys. This activity not only helps him understand what’s his, it will actually come in handy when you’re in a rush to straighten up. However, be careful about training your dog to put other things in his mouth – asking him to pick up children toys or laundry is risky because these items can be choking hazards and because the dog is likely to chew or mouth the items. 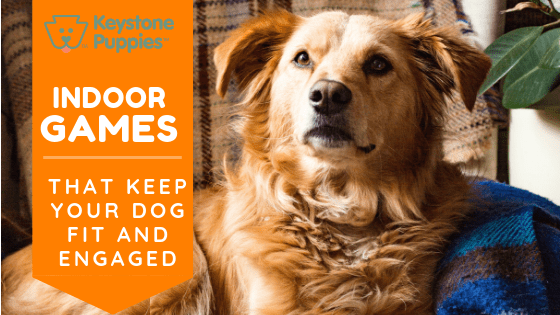 Keystone Puppies cares about your dog’s well-being. No matter how much you exercise your dog indoors, dogs also need to go outside every day to relieve themselves, and some type of outdoor walk should be part of your dog’s routine in all kinds of weather. If you haven’t decided which breed of dog is right for you, research over 200 breeds here. Want to search for your new puppy now? Click here to get started. Keep Your Dog in Shape This Winter!